Exxon and Chevron are very similar U.S. oil giants, but is one a better pick than the other? You wouldn't be too far from the truth if you think the choice between ExxonMobil Corporation (NYSE:XOM) and Chevron Corporation (NYSE:CVX) is kind of like flipping a coin. But there are some important, though perhaps small, differences between the two oil giants that can make a big difference in which one you actually choose. Here's what you need to know to figure out which one is the better buy for you, ExxonMobil Corporation or Chevron Corporation. One of the main reasons to look at Exxon and Chevron is dividend income. Right now, Exxon offers a yield of around 4.2%, while Chevron's yield is closer to 3.9%. That's a reversal of the typical pattern. For most of the last 20 years, Chevron has yielded more than Exxon. That said, if you are looking to maximize current income, Exxon clearly wins, here. Chevron's yield has spiked to around the current level three times over the past two decades or so, but it has generally been lower than it is today. The yield looks fairly generous historically. Exxon, meanwhile, hasn't seen its yield this high since the late 1990s. Using yield as a rough estimate of valuation, Exxon looks particularly cheap, and the yield very generous by historical standards. For yield seekers, Exxon is the better option, even if the difference is simply a few basis points. Exxon has increased its dividend for 36 consecutive years. Chevron has increased its dividend for 31 years. Exxon is again the winner, but not by much. However, there's a deeper story, here. During the deep oil downturn that started in mid-2014, Chevron held its dividend constant for 10 consecutive quarters. That's two and half years without a dividend increase -- a long time for investors to wait (and worry) during an industry soft patch. The only reason the annual streak remained alive was because of the mid-year timing of its dividend hikes. Exxon, on the other hand, increased its dividend each and every year through the downturn. Those regular dividend hikes provided a statement to shareholders about management's still upbeat view of the future. So, while the big picture is similar here, Exxon gets the nod on dividend history as well. To be fair, a lot of the major oil companies paused like Chevron did during this time period, but that just makes Exxon's commitment to rewarding shareholders with regular dividend increases that much more notable. Over the past decade, the annualized growth in Chevron's dividend was 6.7%. That's roughly twice the historical rate of inflation growth. A solid number that investors should look upon favorably. However, Exxon's dividend grew at an annualized 8.4% over the same period. In fact, Exxon's annualized dividend growth has been higher over the trailing one-, three-, five-, and 10-year periods. The difference during any one of those periods isn't huge, but over time, Exxon has clearly rewarded investors with larger increases. That's another win for Exxon. CVX Dividend Per Share (Quarterly) data by YCharts. The balance sheet is another important factor to examine when you look at a dividend-paying stock. Too much debt makes it hard to support a dividend. Chevron's long-term debt makes up around 16% of its capital structure. That's a very low level of leverage for any company, and it suggests that Chevron is very strong financially. Even during the worst of the downturn that started in mid-2014, when oil giants across the board were using their balance sheets to muddle through a rough patch, Chevron's long-term debt only rose to about 20% of the capital structure. While Chevron's leverage stats look impressive, the story is even better at Exxon. Exxon's long-term debt is roughly 10% of its capital structure today. And at its worst, it only rose to around 15%. It's also worth noting that Chevron and Exxon are both toward the low end of their peer group when it comes to leverage. However, once again, Exxon wins even though the balance sheets of both companies are strong today and remained strong during the downturn that started in mid-2014. Being able to sustain a growing dividend requires growth over the long term. And on that score, Chevron has been doing a better job lately. The company's production fell 1% in 2016, after a period in which oil majors were pulling back on spending. However, it rose 5% in 2017, and production growth has continued through the first nine months of 2018. Exxon's production fell 1% in 2016 and another 1.7% in 2017. Worse, Exxon's production continued to decline through the first nine months of 2018. This is one of the main reasons Exxon's yield is so high historically and relative to Chevron. That said, the two have very different plans for the future. Exxon is ramping up its exploration budget, with big projects planned in the U.S. onshore space, offshore, and in natural gas. It expects this spending to get production growth back on track. Early results suggest it is having some success, with production growing sequentially between the second and third quarters of 2018. The driving force of that shift was onshore U.S. drilling activity, which is only one of the company's big drilling projects. Chevron, meanwhile, has opted to hold its capital budget steady for the foreseeable future. That doesn't mean it can't continue to grow production, only that it has chosen a more conservative course than Exxon. That, in turn, could lead the two U.S. oil giants to switch places on production growth in the future. Chevron looks like it wins on this front today because its past investments are paying off right now, but Exxon's spending could turn the tables in the future. Since the future is uncertain, Chevron gets the nod on this point, but only by a slim margin. So far, Exxon seems to have the edge over Chevron, but the differences between the two companies aren't dramatic. You could pick either one and end up a long-term winner. And that brings up the last point: diversification. Both Exxon and Chevron are integrated oil giants, with investments that span from upstream (oil and gas wells) to downstream (refining and chemicals). And both have very public and prolific distribution, notably via branded gas stations. However, through the first nine months of 2018, Exxon's downstream operations amounted to about a third of revenues. Chevron's downstream business made up about 22% over that span. That suggests Chevron is a little more exposed to the ups and downs of oil prices than Exxon because it has a heavier reliance on its upstream business. That's not a bad thing if you want to have a bias toward oil prices, but it helps explain why Chevron chose to pause its dividend when oil prices were falling. Exxon, with a bit more diversification (and a tad less leverage) was able to weather the storm in stride. This is a win for Exxon for investors with a conservative bent. However, for those who believe oil prices are going to head higher, Chevron could easily be called the winner. So really, it's a toss-up. When you look at all of the points above, one thing becomes painfully clear: Exxon and Chevron are pretty similar. Neither one would be a bad energy stock to invest in. 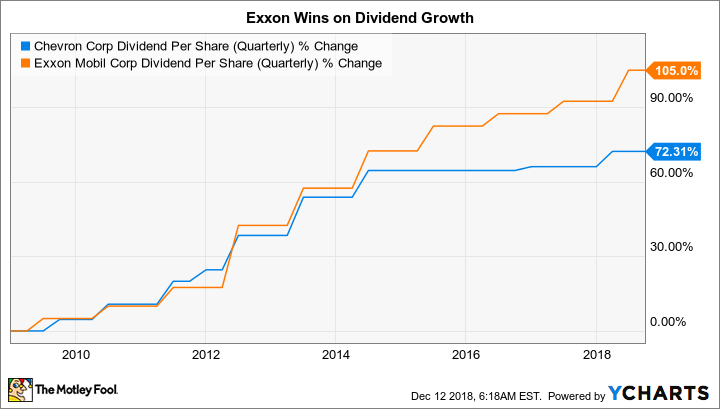 However, for most dividend investors, particularly those who are more conservative, Exxon's small wins in four of the six points above should give it the edge. The other two points weren't clear enough victories for either company to push Chevron ahead.